A new contest called Hubble's Hidden Treasures asks amateurs around the world to search through the Hubble space telescope's vast data archives for breathtaking images. Entries must be in by May 31, 2012. Since its launch in 1990, NASA's Hubble Space Telescope has made more than 1 million observations — and now scientists want your help to go through them all. 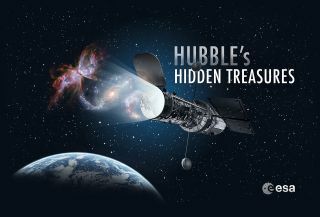 The telescope's operators have launched a contest called Hubble's Hidden Treasures, which asks amateur astronomers around the world to search through the telescope's huge data archives for breathtaking images that have yet to see the light of day. Call it a celestial Easter egg hunt. To participate, find a suitable dataset in the online Hubble Legacy Archive, edit it using the provided tools and submit the finished product to the Hubble's Hidden Treasures Contest Flickr group. You could win an iPod Touch if your entry dazzles the judges, contest organizers said. Participants can also process Hubble archive images the same way professionals do, using powerful open-source software called FITS Liberator. Entrants choosing this route can submit their final images to the Hubble's Hidden Treasures Image Processing Contest Flickr group — and get a shot at winning an iPad. Both parts of the competition end on May 31, officials said. For more information about the contest, visit the Hidden Treasures webpage at: www.spacetelescope.org/hiddentreasures. The Hubble Space Telescope is a joint effort between NASA and the European Space Agency and launched in April 1990 aboard a NASA space shuttle. In the 22 years since, Hubble has revolutionized the way humanity views the cosmos. The telescope's observations revealed, for instance, that the universe is expanding faster than anyone had realized. This finding helped lead astronomers to the probable chief cause of this accelerated expansion — the mysterious "dark energy" that makes up most of our universe. The telescope has been repaired five times over its long life, but it's expected to keep going strong until at least 2014.